My Space has more visits, visitors, page views, and average stay than Facebook (as of September at least). 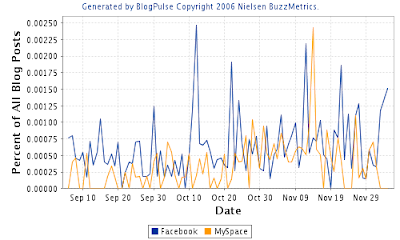 When I looked at those stats and generated this chart, it occurred to me that all the buzz, or chatter, focused on Facebook has been the best thing to happen to MySpace in the past six months. The volume of the chatter, which has been remarkably high in the past few weeks in particular, has taken enormous attention off the market leader. Indeed, it has created the perception that the bigger site (from any number of metrics), now plays an underdog role. Moreover, I'd bet it has enabled them as a company to be focused on execution, and not fending off press and attention related to valuation, or beacon, or whether the CEO wears shoes. In fact, in my mind, the most important social networking ad news of the year was the launch of the MySpace targeted ad platform. Much more important than apps or beacons. In this case, maybe Goliath has in fact become David.